Let's take a step by step look at putting together a complicated graphic in Fireworks. This image was actually created in Photoshop. 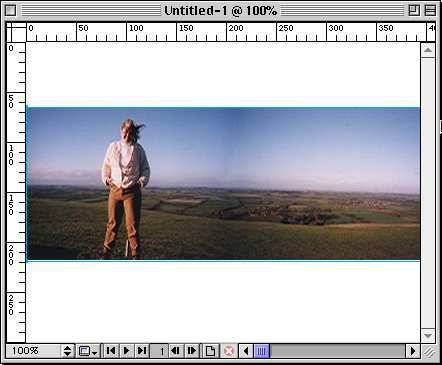 I had two pictures that were joined together to create this panoramic view of me standing on a hill overlooking Salisbury Plain in England. The picture was imported into Fireworks. On a new layer the outline was carefully drawn with the pen tool. The original scanned image (on the first layer) was then thrown away. This left an outline image of the UK as a vector image. 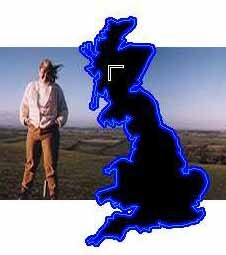 The vector image outline of the UK was dragged and dropped on the photograph. Next, another scanned image (a map of Stoke on Trent) was set to be imported. Notice how the cursor has turned into a 90 degree angle? 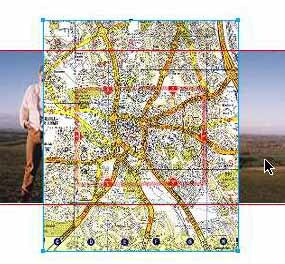 This shows that an image is set to be imported into the current document. The map of Stoke on Trent as imported into the document. 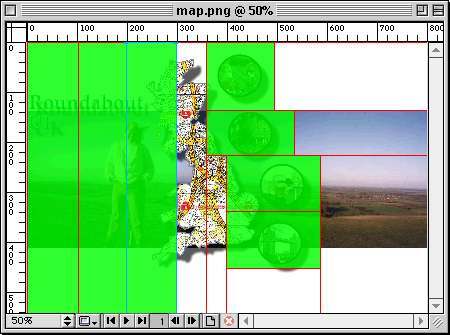 The outline map of the UK was selected as well as the map of Stoke on Trent, then Edit>Paste inside. Now a filled oval was created. This was copied three times, until there were four ovals. Now a Stroked oval (with no fill) was made, just a tad bigger than the filled oval. The text tool was selected and the text "Gnomes & Cones" was typed. 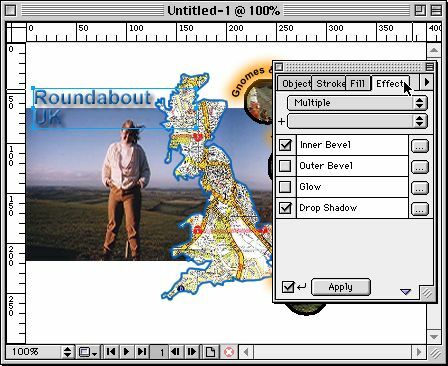 The stroked oval was selected, the text was selected and the text was attached to the path of the stroked oval. To get the text to align the way I wanted (centered on the top of the oval) I selected alignment center, which caused it to be centered on the horizontal instead of vertical axis. I then rotated the text 90 degrees counter clockwise to get the look I wanted. The text for the other buttons has been added, as well as an orange 'glow' around them. This was chosen because of the dark areas where the text would have to be placed. Next, the title of the piece is added. Frames three, four, and five each had a different name of a button. Next, click back to frame one. Notice that you can add a URL if you want. In the example that you will see in a minute I didn't add a URL, but when this is actually in use the buttons will be the navigation for the site and will have a URL attached. Click the plus button in the Behaviors window. In the Swap Image window of the Behaviors Window you have the option of choosing which frame you wish to swap. Continue with slicing and adding the Swap Image behavior, each time changing the fame you wish to swap. 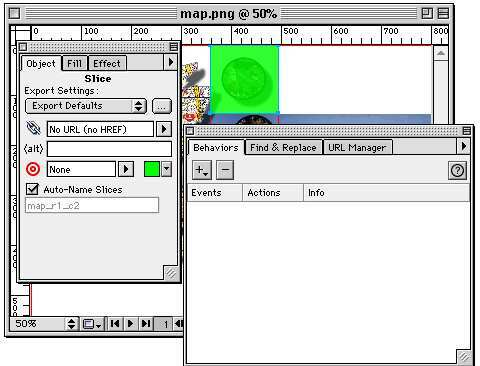 Once you have sliced all of the buttons, and created the Swap Image behaviors, continue to slice the image. Upload all the files to the server. Click here to see what this image looks like.